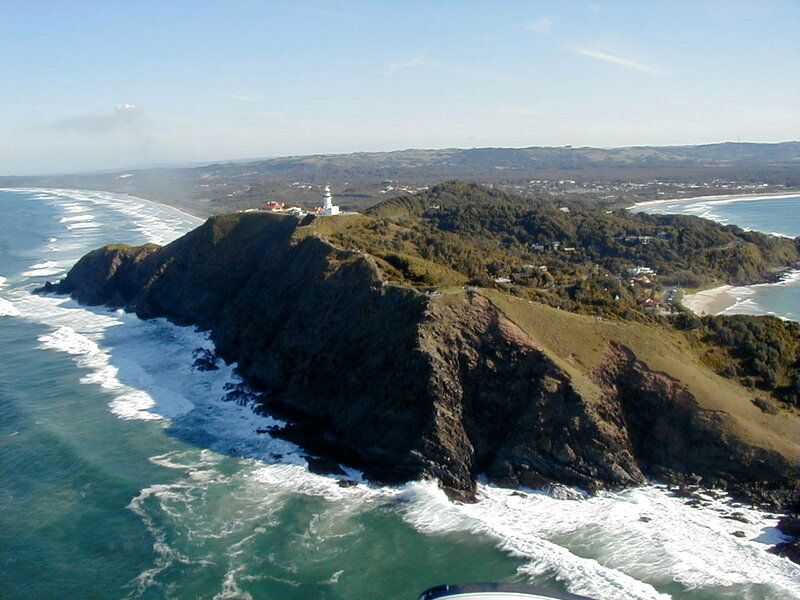 En route to Sydney my next destination was Byron Bay. I arrived late afternoon, laden down with my (getting heavier by the minute) rucksack, and checked in at First Sun Caravan Park, where I had booked a cabin for the next three nights. 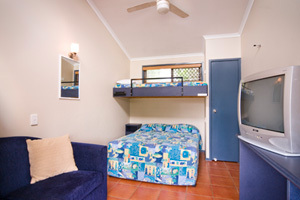 The cabin was small with a double bed, sofa, TV and fridge but it was very cosy. I dumped my bags in the room and went out to the tourist information centre where I booked myself on a half day horse-riding trip and an early morning climb to the top of Mount Warning to watch the sunrise. With a couple of activities to look forward to I went to buy breakfast stuff and a couple of beers and spent a lovely evening chilling out and watching TV with a cool Castlemaine XXXX. 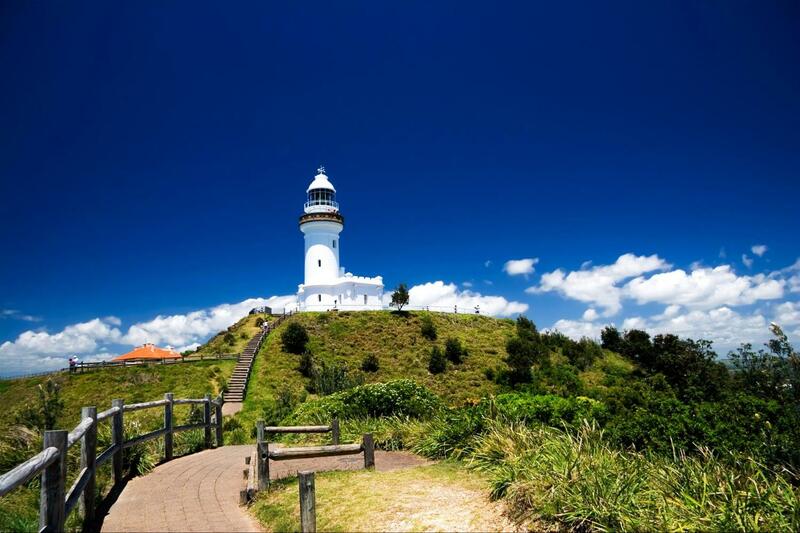 The next day I had a free day, so I walked to Cape Byron Lighthouse. It was about 3km away and is the most easterly point on mainland Australia. It was tough going as it was mostly uphill and it was the hottest day by far. But it was worth the effort because I walked through a scenic coastal rainforest and when I arrived the views were spectacular. I spotted a turtle in the sea and then along came a pod of 15-20 dolphins hunting and playing in the surf. They looked small from my vantage point but you could still see them blowing air from their blowholes. A few other people noticed this amazing sight and we all watched transfixed for over an hour. It is truly a wonderful sight and one that makes you feel very happy. Everyone seemed so relaxed here and there was hardly anyone on the beach so it is easy to find a spot for yourself. The beaches are fantastic – long beautiful golden sands that stretch for miles, with the crystal clear blue water lapping at its edges. After spending another evening chilling out I was up early for horse-riding. I was picked up at a local bar by the people who worked at “Seahorses” and we drove to Lennox Heads where we unloaded the horses. The girls saddled them and we were then allocated the horses, depending on our riding ability. I was given a brown horse called Buttons. We gently rode along seven mile beach, walking, trotting, and cantering for a while. I love horses but don’t ride that often so when I do I just love it. Especially when you ride in a setting such as that one- a long, sprawling beach with only the smell of the sea, and the wind in your hair. We got back to where our vehicle was parked and changed into our swimming gear. The horses were de-saddled and we led them towards the sea. My horse, Buttons, apparently didn’t like water so I had another horse called Kira. I tried to get on Kira, with the help of one of the girls’ thighs, but every time I tried her leg gave way! Too many cakes?! No! She just had a weak thigh! Eventually I managed to climb onto Kira but it was all I could do to stay on. It is really hard to stay on a horse with no saddle. My thighs got a really good workout! Kira was led into the water with me sliding around on top. We didn’t go into the water that deep but we both loved it- me with a massive smile on my face and Kira pawing at the water with her hooves to keep cool. Afterwards we had a lovely BBQ. It was such a great day- doing something you love in great surroundings and with good people (and animals). It was one of those days that makes you feel glad to be alive. I got back to Byron Bay to prepare for my very early morning start to Mount Warning. I got up at 1.20am and waited in the car park, as instructed, until 2.30am. No one came to pick me up. The security guard said that if they arrived he would come and get me from my cabin. I went back and stayed awake until 3.15am just in case they arrived late. But still no one came so I went back to bed. You cannot imagine how disappointed I felt. I was really looking forward to hiking to the top of Mount Warning to watch the sunrise. The next day I went to the tourist office to find out what had happened. I explained that I was never picked up despite me booking the trip. The travel agent rang the guy in charge of the trip and he told me that there was a mix up with the booking. He promised that if I ever went back to Byron Bay I could get the trip for free. I wonder whether he will remember saying that after nine years! 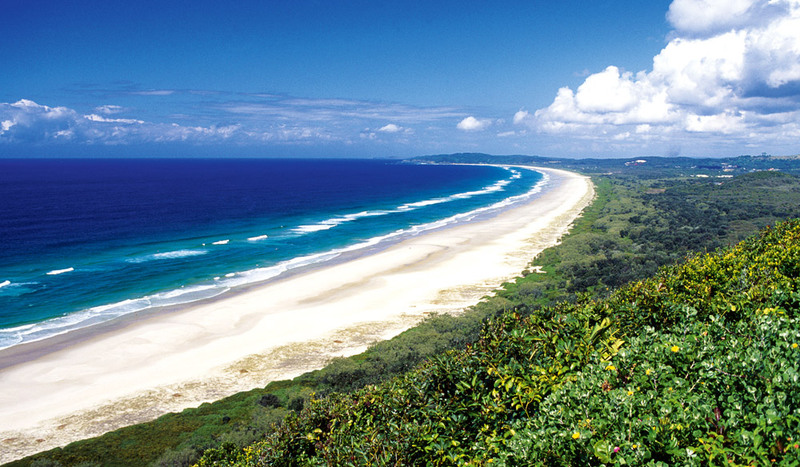 I had a lovely few days in Byron Bay. I totally recommend it to anyone who is thinking of going there. I spent my remaining hours there in a little café sheltering from the rain. When it finally stopped I walked to the beach to watch the surfers until it was time to get the coach to Coffs Harbour.